After I wrote an article introducing tea in Taiwan in 2016, I was contacted by representatives from several Taiwanese tea-related companies and organizations. One of these was Sam, one of three permanent residents at Global Tea Hut (國際茶亭)’s headquarters, “Tea Sage Hut (通聖亭),” in Miaoli (苗栗), a smallish county capital in Central-Western Taiwan. At first I assumed they were some kind of tea distributor like the others who’d contacted me, but upon closer inspection of their website I soon realized they were much more than that. Visiting Global Tea Hut has been one of my most interesting experiences in Taiwan. To learn more about Miaoli, where Global Tea Hut is based, check out my complete guide to Miaoli County. The teas they mail out are all organic and contributed by farmers that practice environmentally friendly growing methods. 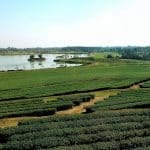 Many of them are “living teas,” which means they are seed propagated and grown without irrigation or agrochemicals under biodiverse conditions (as opposed to being cloned from a cutting and monocropped, as most of the tea in the world is). My initial reaction to all of this was one of intrigue. 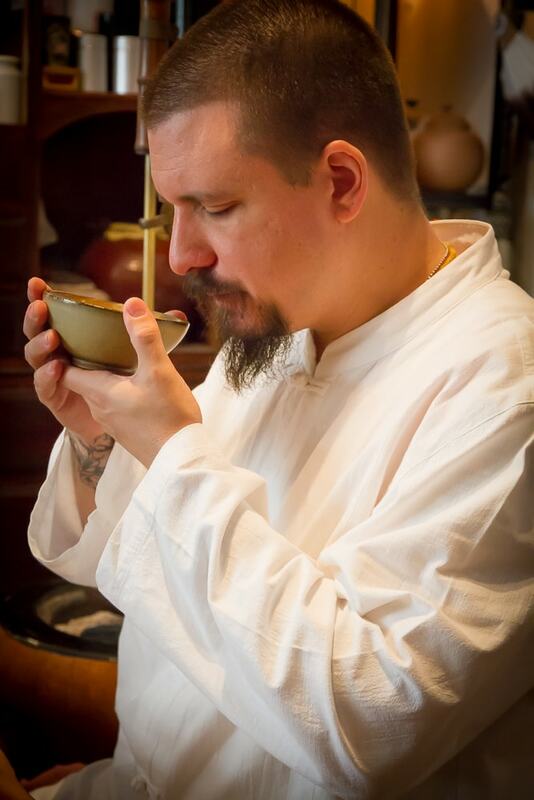 I studied anthropology and religious studies (Wu De himself majored in anthropology and philosophy), and I currently have a growing interest in tea. 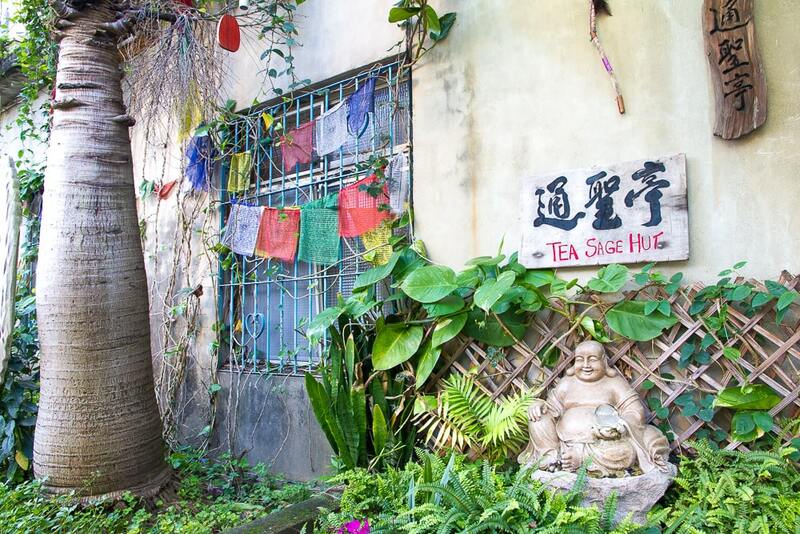 A Western monk living and preaching the way of tea in Taiwan? I had to investigate further. When I received my first copy of the magazine, I was impressed with the quality of the material. First off, each month’s magazine includes a large section detailing everything you could possibly want to know about the tea of the month, from origin and history of the tea to suggested brewing methods and taster’s experiences. The writing is academic with poetic touches, and Wu De’s background in anthropology shines through in his holistic approach, bringing in aspects of biology, chemistry, psychology, culture, medicine, religious studies, and history. There are spiritual undertones throughout, but never to a point of being doctrinal or telling the reader that or he she has to believe or think in any particular way. 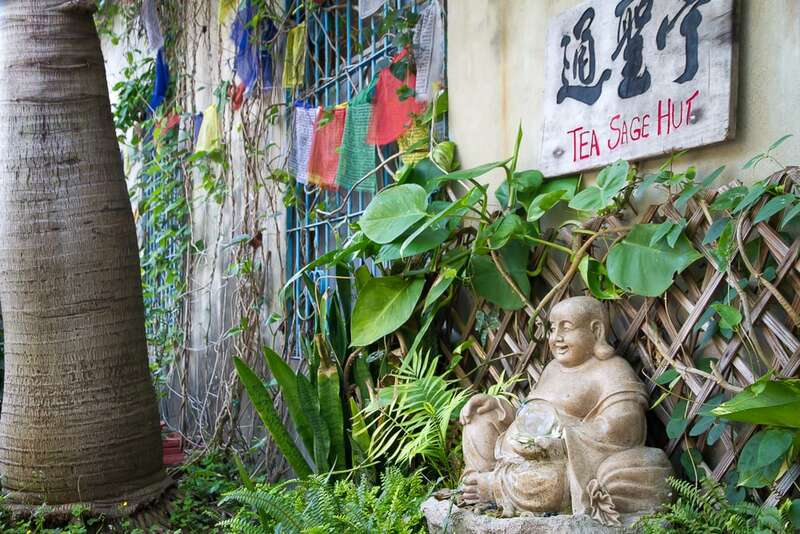 The magazine includes articles from a variety of writers, some of them contemporary experts on tea, others Global Tea Hut members from around the globe. Past issues are available for free on their website, and every issue includes recommended reading and additional resources from past issues. What’s more, the magazine occasionally includes English translations of never-before-translated ancient Chinese texts, such as the Song Dynasty Emperor Huizong (宋徽宗)’s Treatise on Tea (大觀茶論). The emperor was apparently such a fan of white tea (白茶) that he would sneak off into secret corridors in his palace to brew tea for himself, and so that issue complemented a tea of the month that was a living white tea (April 2016 issue). 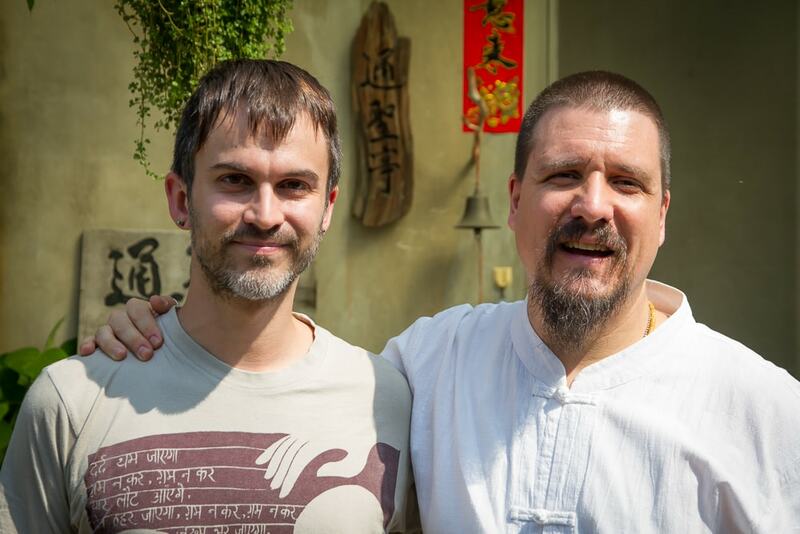 When I first touched base with Sam at Global Tea Hut, he extended an invitation to come visit the center. Most people stay overnight or for up to three weeks, but given that I am a stay-at-home Dad, I accepted the offer to make a half-day visit the following month. Sam recommended visiting on a Tuesday, when they offer a cha dao class. Every day of the week has a different activity, for example, Mondays are devoted to cleaning the premises and maintaining a garden, Wednesdays include a class on the linear (or “nerdier”) aspects of tea, and so on. A few weeks before visiting the center, I met a person online who had stayed at Tea Sage Hut previously for the full three weeks. He described Wu De as being so knowledgeable on tea that he found him intimidating. 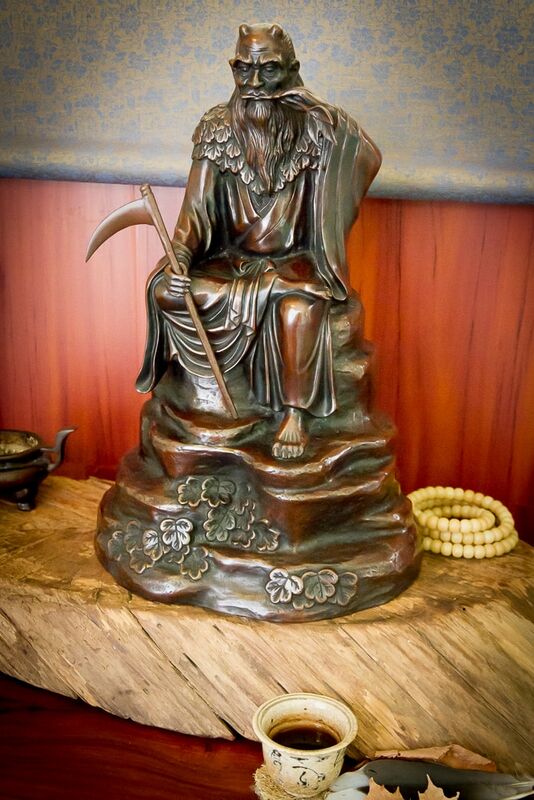 According to this person, Wu De could taste any tea in the world and tell you exactly what variety it was. In order to get to Miaoli on time for the 8 am one-hour meditation that starts every day at Tea Sage Hut, I had to wake up at 5:30 am and catch the first High Speed Rail of the day, a 44-minute, NT$430 (US$13) ride. The HSR just recently opened it’s Miaoli station, and only runs there once every 30 minutes until 8 am, and then hourly for the rest of the day. I could have paid half the price for a two-hour ride on the local train, and the Miaoli TRA station is actually closer to Tea Sage Hut, but I didn’t want to get up so early that I might fall asleep during the meditation class. I’ve been to places in Miaoli County (苗栗縣) several times, but never had a reason to visit the city itself. Pulling up in the HSR, I was impressed with how green Miaoli City and surrounds are. Despite being a county capital, it is not even in the top ten in Taiwan in terms of population. Miaoli residents boast about their pleasant weather, with the Central Mountain Range (中央山脈) visible to the east and shielding the area from most typhoons and rainstorms. When I got into a taxi and said the street name, the driver knew the place right away, indicating plenty of foreigners went there. “What is that place?” he asked in Mandarin. 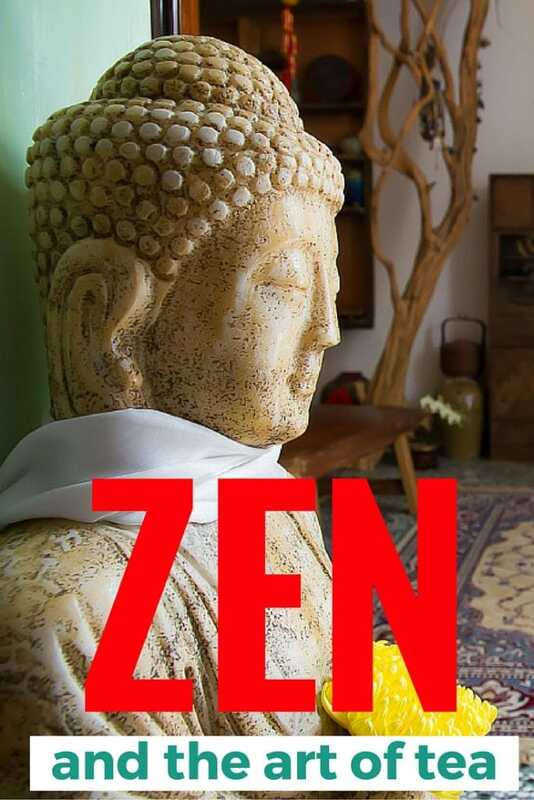 “It’s like a…an American zen temple and a hotel for foreigners.” “Huh?” he replied. “Um…It’s a kind of teahouse. They drink tea and meditate.” The driver looked even more perplexed and said nothing, so I promptly changed the subject. 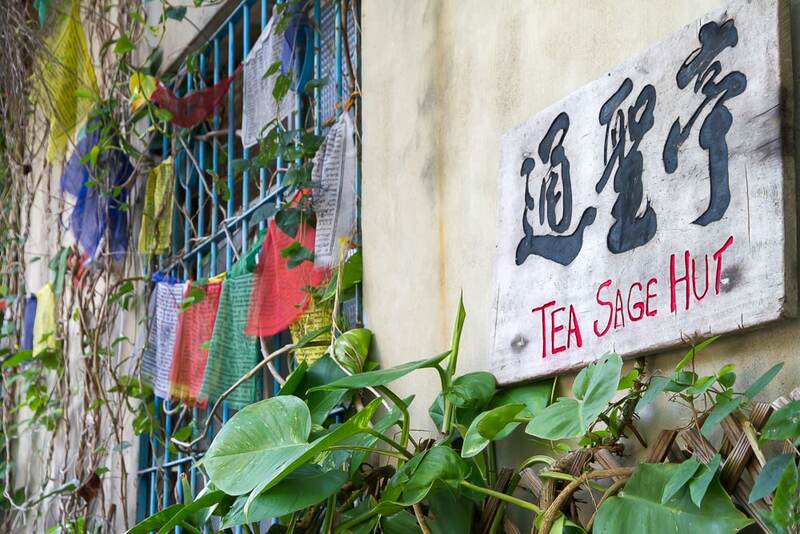 Tea Sage Hut is in the southeast of the city. After passing a row of betel nut beauties near the HSR station, which lies just north of the city, and then circumnavigated the city on an outer ring road, we crossed a bridge then entered the city proper. The taxi then turned down a number of increasingly narrow, unmarked lanes then alleys before stopping before a kind of building that exists in the south of Taiwan but us Taipei apartment-dwellers are totally unfamiliar with: an actual house. 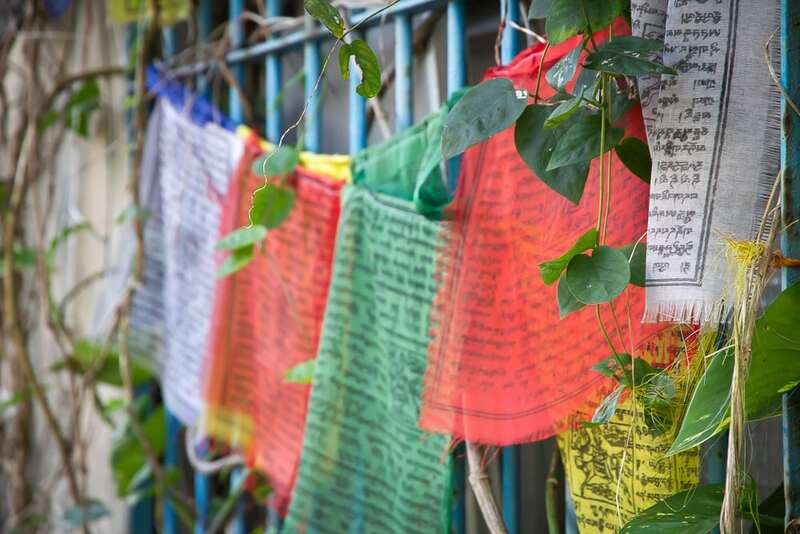 With prayer flags strung on the outer walls, a coy pond watched over by a Buddha statue to the side of a rocky courtyard, and the large black characters 好茶 (“good tea”) and 奉茶 (“to revere or share tea with respect”) emblazoned on the outer wall to either side of the door, I knew I was at the place. I was soon greeted by Shen, a slim, handsome Western man in a white tang zhuang (唐装), a traditional Chinese suit top for men), who is the second of the two permanent initiates studying under Wu De at the center. Shen proceeded to give me a quick tour. The main room of the house serves as the tearoom, with a large wooden table occupying much of the floor space. Behind it, a chain running through a bamboo pole hung from the ceiling from which a pot of tea could be hung over a charcoal fire. The walls on all sides had shelves holding all manner of tea paraphernalia, teapots, compressed tea cakes, and so on. At the front of the room stood a simple alter. To the right was a doorway that led to a meditation room, and to the left the kitchen and dining area. Above the dining table was a short list of rules including: hug every person here once per day. Just before 8:00 Shen sounded a gong several times to indicate to guests upstairs that it was time to rise and join the morning meditation. Before going through a beaded door curtain with the character 茶 (tea) on it and into the elevated meditation room, participants anointed themselves with water from a stone basin. The one-hour meditation was a guided recording by Wu De. It was a simple, 50-minute focus on the breath that ended with ten minutes of meditation on metta (loving kindness). 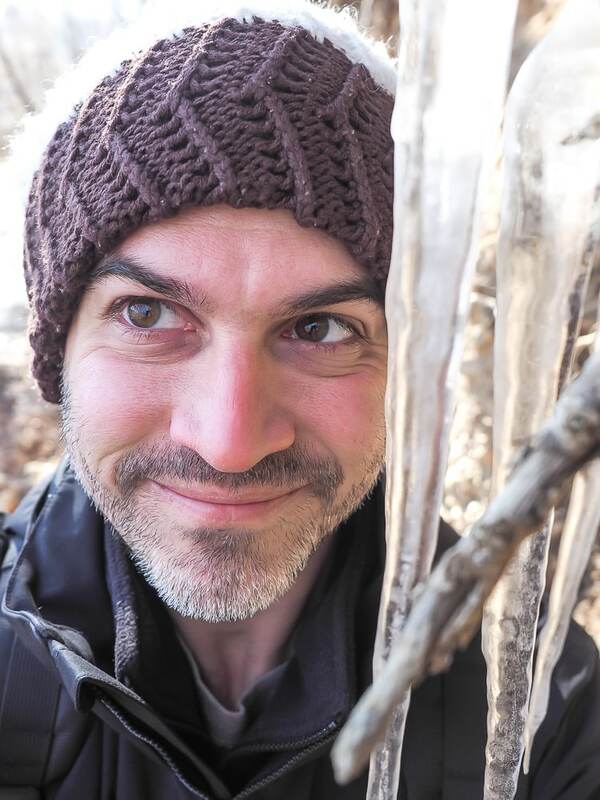 I haven’t tried to meditate in quite some time; for the past two years my life has been very hectic, with my wife and I both working and sharing the responsibility of taking care of our two-year-old son Sage and seven-month daughter Lavender. My body is not in good shape right now, and as such the meditation was tough for me physically. My legs cramped up about halfway through, and my back and shoulders were stiff by the end. Mentally it was relieving though, as I seldom have an entire free hour at my disposal to simply sit in contemplative silence. Next, meditation led into a silent breakfast, which was less awkward than it may sound. It was just after breakfast that I got my first, and then second, of several random hugs that day. 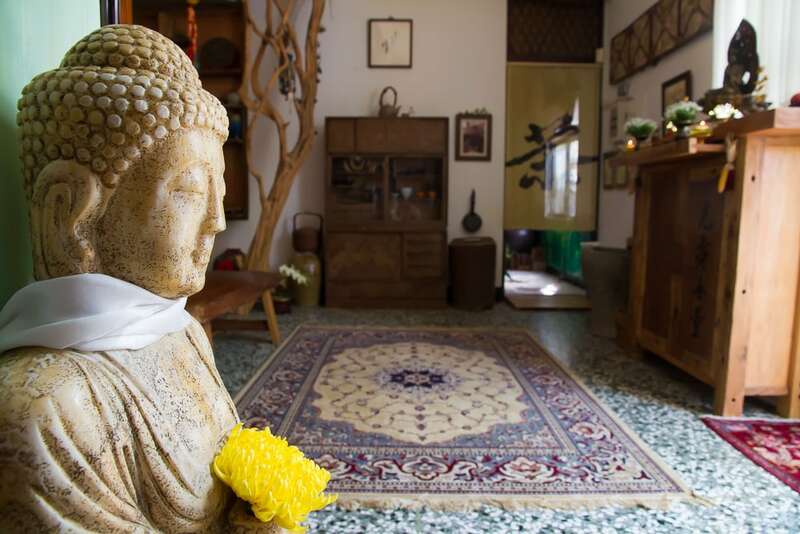 The center, as you might imagine, attracts a mixed bag of people, from tea nerds and individuals working in the industry to hippie backpackers and spiritual seekers. But one thing every person I met that day had in common was that they were all outwardly kind, humble people, the kind who are comfortable in their skin, who give every person a chance, who do things like fly around the world to do meditation and stay in a zen and tea center and eat vegetarian food and give random hugs to likeminded people. In short, they were the kind of people that I like. The breakfast then led into a tea session led by Wu De himself. 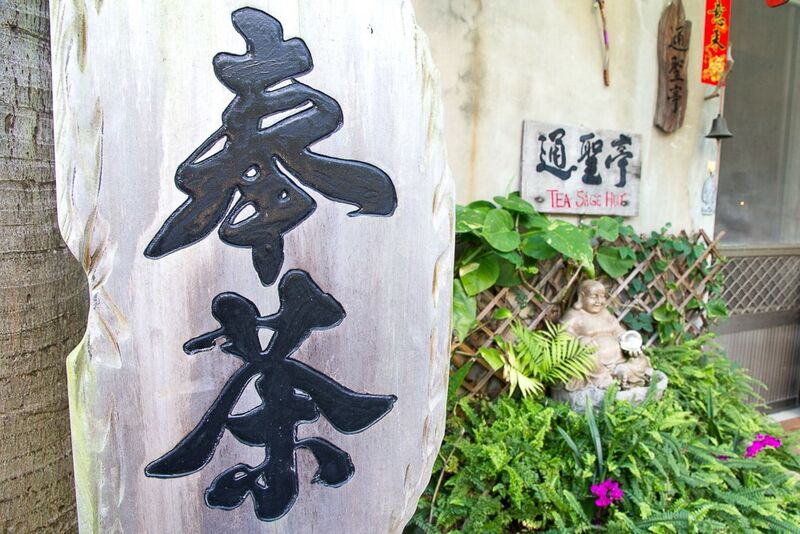 Wu De would later describe this part as the crux or heart of everything that he and the Global Tea Hut are all about. Despite all the detailed, wordy jargon in the magazine and Wu De’s forthcoming cha dao lecture, he would later insist that it all boils down to one thing: the sharing and blissful enjoyment of tea. No words transpired during the hour-long tea session, but the silence was filled with the rising and falling drone of meditation music and the bubbling of Wu De’s tea kettle. Wu De was as intense as I had expected based on the former student’s comment I mentioned above. I’d passed him once or twice earlier in the morning. He came across as distant and unsmiling (or maybe he’d just woken up and hadn’t had his morning tea yet? ), and hadn’t returned my nod and smile. His severity faded once the tea session began, or rather melted into an austere focus on the preparation and serving of the tea. I don’t know much about gong fu cha (功夫茶), that is, “skilled tea” or the Chinese tea ceremony, so I don’t know how true to type what followed was. In fact, as Wu De later explained, we were enjoying this morning’s tea not gong fu style but in the simplest of five methods: bowl tea. 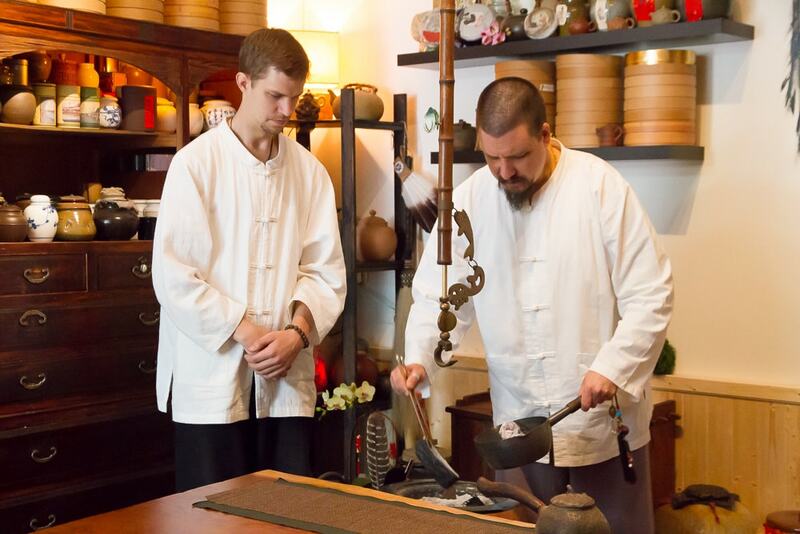 Wu De recommends any cha dao student to stick to nothing but leaves and hot water in a bowl for at least 6 months, developing a relationship with and love for the tea before even attempting to learn the skills necessary to execute gong fu tea. Bowl tea can be subdivided into three methods: direct bowl tea, bowl tea poured from a side-handled pot, and boiled tea. Our morning’s tea session was the second of the three. A side-handle pot has essentially the same result as leaves placed directly in one’s bowl, but helps to prevent pieces of tea from certain loose varieties from getting into the bowl. Wu De proceeded to heat a kettle, closing his eyes and placing his left hand on the handle, feeling the vibrations of the bubbles to determine when perfect temperature had been achieve. He precisely lined up seven bowls, one for each person at the table, himself included, turning each one 45 degrees after setting it down. He then warmed each bowl with hot water, put several large pinches of withered black pu-erh tealeaves (普洱茶) from a bowl on the table into a pot, added hot water to rinse the tealeaves, then dumped the water into a basin. He filled the pot again, steeped it for about 30 seconds, and then poured the tea into the bowls, only a splash at a time, going back and forth along the seven bowls about four times, in order to evenly distribute the liquor from the top and bottom of the teapot. Wu De then passed us each a bowl, pausing to look into each of our eyes for the first time since the session had begun. I felt nervous knowing the eye contact was coming, though I also felt the superficial barrier I’d created between us dissipate once we finally looked into each other. The tea was a sheng pu-erh, pu-erh (普洱茶) being a distinctive aged tea produced only in Yunnan Province in southwestern China. Pu-erh is true black tea, the darkest and most robust of all teas, and not to be confused with what Western people call black tea, which is “red tea” (紅茶) in Mandarin. “Sheng” (生), or raw, refers to a variety that is fermented naturally over a long period of time. The tea we drank that morning was a five elements (五行) sheng pu-erh blend, meaning five different pu-erhs, each associated with one of the five elements, had been combined in ratios that achieve a perfect balance between them. I’ll admit that I’m not a huge pu-erh fan. 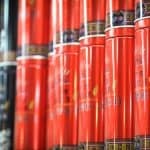 Pu-erh has a truly unique flavor, one that I lack the vocabulary to articulate, and I do enjoy it on occasion, but it’s just not my favorite. The tea we drank in this session was however the best pu-erh I’ve ever had, likely an indication of the quality of the tea itself in combination with the brewing execution by Wu De. The water temperature was perfect when it hit my lips, and the tea was as thick and robust as black oil, yet went down smoothly. After I finished the first bowl, I noticed a tingling sensation in my mouth that persisted for the duration of the tea session, somewhat akin to (but much milder than) the mouth-numbing feeling of Sichuan flower peppers, minus the spiciness of the dishes they are usually served with. After the first round came another. And another. And another. Twelve in total, if I counted correctly. After the third cup, I began to feel an intense warmth taking over my body, resulting in a head rush. After the fourth cup, the music, which was sitting on a mantra-like, low vibrational frequency, seemed to be reverberating in the depths of my body, pulsating from my inner core and emanating outwards. At this point I reached a meditative state that was far greater than where I’d been at during the morning meditation, or maybe it was just the culmination of the morning’s silent activities. I followed up on the urge to close my eyes and take deep breaths, allowing myself some time to reside, and to revel, in the euphoria. I remember wondering how much more tea we’d be drinking after that. Around bowl #8 I started to feel a little tea drunk and considered declining a round or two as some other people at the table were starting to do. But I pressed on. By the last cup, I had to break to pee, and noticed that I was twitching mildly as I used the restroom. At this point I realized it might have been a bad idea to have that cup of coffee on the train ride down from Taipei, but I don’t think I could have made it from 5:30 am to teatime without some caffeine in my system. One final observation I made before the session came to a close was that Wu De had never once replaced the tealeaves in the pot. This meant that those few pinches of tealeaves had produced 70+ bowls of tea! And still, the tea remained flavorful till the end, but those flavors transformed with every round. I’ve heard before that pu-erh can be steeped this many times, but never had the stamina to attempt doing it on my own. 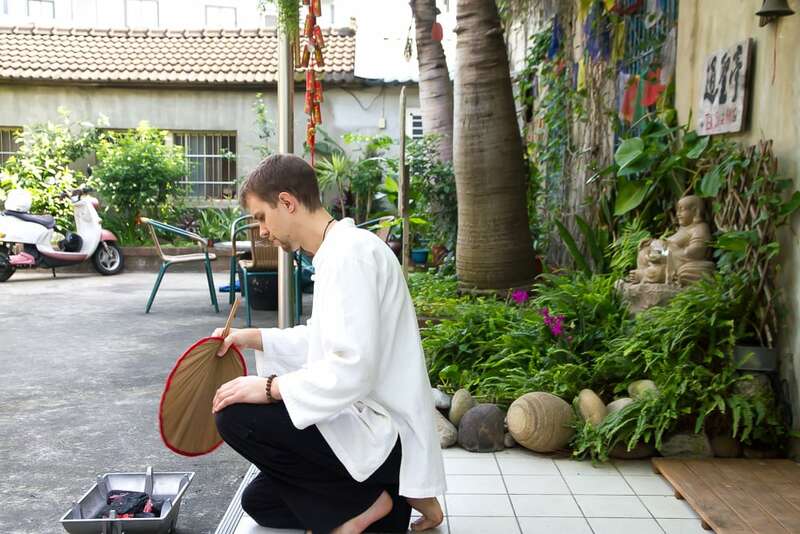 · The practice of cha dao goes back millennia. · The famous tea terraces at Wuyi in Fujian were originally (and painstakingly) constructed as altars. The people didn’t begin making a profit from them until relatively recently. Tea was considered a sacred plant. 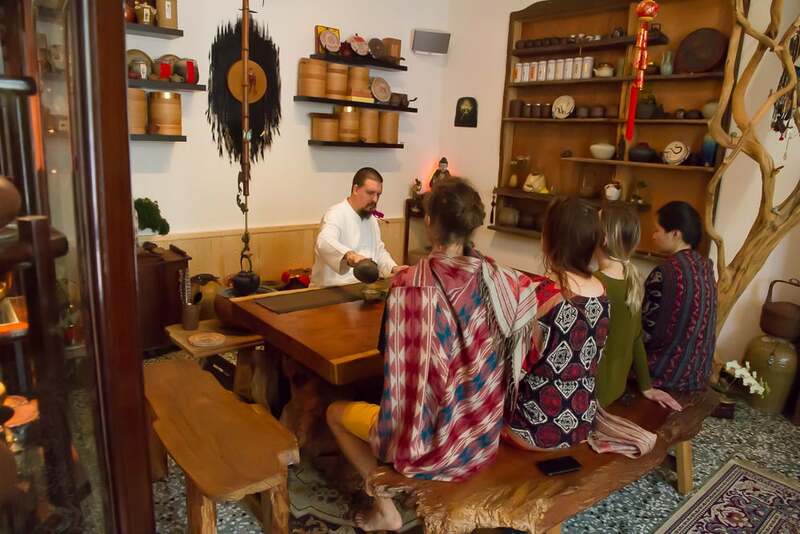 There have been recent efforts by locals in the area to re-recognize the sanctity of tea and bring back some ancient tea ceremonies. · Modern tea planting methods and tea terraces are photogenic but terrible for the environment. Going organic is essential, and “living teas” are ideal. · Tea is an ancient form of Chinese medicine, but using plants as a medicine requires participation. You need a relationship with the plant. You can only get out of this relationship what you are willing to put in. · Children still see the world as alive, not as objects to be used, as people in ancient times did. Most of us lose this ability as we get older. · All the indigenous tribes in Yunnan, the birthplace of tea, believe they were descended from tea. · Drinking tea provides a sacred space where one can develop one’s relationship with the earth, and also be or become the person one wants to be. · Tea (like food) that is made with love actually tastes better. · Gong fu tea helps to breed sensitivity. A balance of both is ideal. · 3 billion people drink tea every day; it’s a unifying medium. · Biologically, as a high altitude plant, the tea tree has extremely long, complicated roots that access elements in the earth not available elsewhere. · Tea is an avatar of love; Mother Earth shows her love for us by offering us this plant. 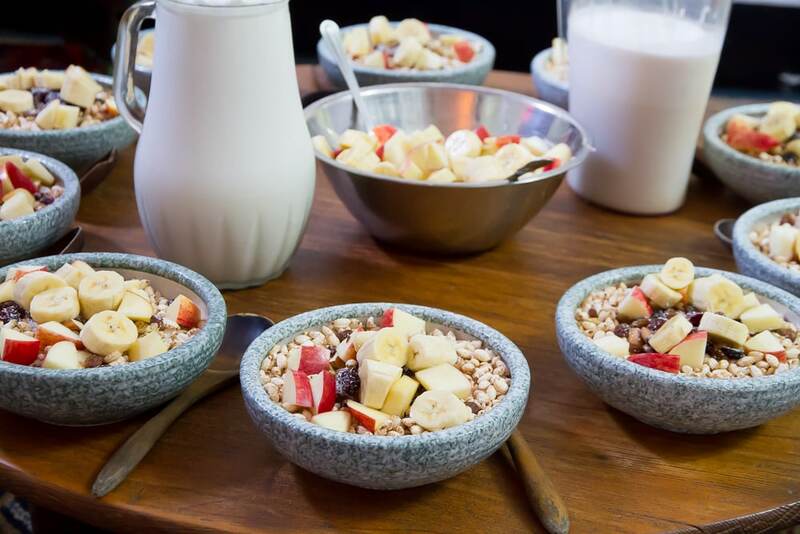 · We can connect to nature through any plant, but tea is special in that it is so ancient, so widely consumed, so healthful, and brings together so many people. 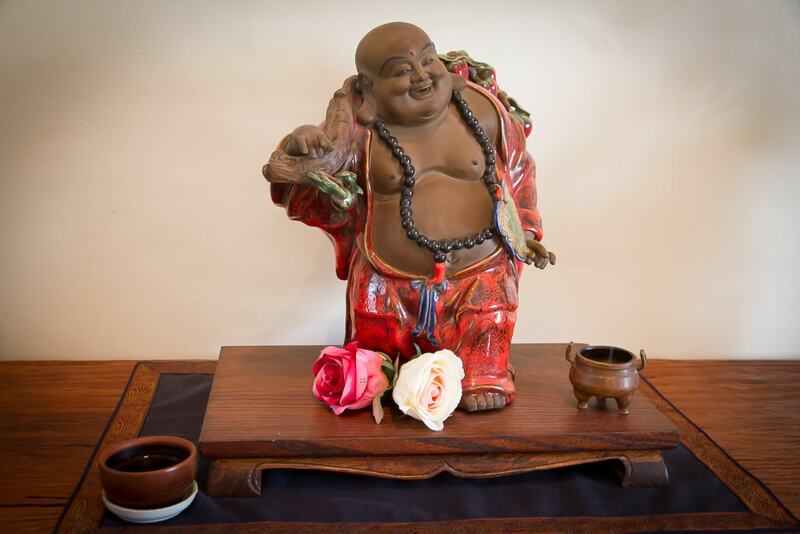 · Wu De considers tea his one true love, and compares looking at other plants to cheating. Tea has saved him and healed him, and he lives a life of bliss devoted to honoring and respecting this gift the Earth has given to us, and to sharing it with others. With all of that to think about, we stopped for lunch. As soon as the session was over and people began to leave the table, Wu De approached me and told me he hadn’t had a chance yet to give me a hug. His sudden display of openness made me realize perhaps I’d misjudged, or at least misinterpreted his demeanor earlier that day. During lunch he laughed and joked with others, picked at his dry skin, and fiddled with the Buddha ring on his pinkie. It made me realize he’s just an ordinary guy who has found his calling in the world, and takes it quite seriously. There are many paths to liberation, but those who have found their own, and dedicate their lives to sharing it with others, serve as an inspiration to us all. As we munched on stewed veggies, fried greens, and hard-boiled eggs, each member of the group took a turn sharing the things he or she felt grateful for that day. I felt a little nervous and put on the spot, so I quickly mentioned a few recent life changing events and my kids. But every person after me took their time, answering more completely, thinking carefully before talking. It made me realize that I shouldn’t be so rushed (it’s an engrained habit because my day-to-day life is so busy), and I have to let down my guard a little and be more open when people are willing to listn. I shouldn’t be afraid to show my true self. I could have said much more, and regretted not having done so later. I should have said how grateful I was to have a whole day like that to come participate in Global Tea Hut’s vibrant, ever-changing, ever-expanding community of people. I rarely see even my closest friends these days because I’m so busy being a parent, and even when I do see them, we mostly just go out drinking and talk about unimportant things. I appreciate my friends, but I also appreciate this rare opportunity I had to expand my knowledge, view the world from a new angle, and meet some beautiful people. It took me back to my days of backpacking, but maybe this is a feeling I need to stop missing, and start reincorporating into my life, even though my lifestyle has changed so much. I’m also grateful for my wife, who is my life partner, and with whom I face and conquer so many challenges. It was thanks to her for being willing to stay home with the kids all day that I was even able to go off on this trip. But the things that I brought back from my visit to Tea Sage Hut will make me a better person and positively impact my family and those around me. If all of this sounds like your cup of tea, than I encourage you to consider Global Tea Hut’s tea of the month program, or at least have a look at some of the free back issues on their site to see if it’s for you. And even better, if you are in Taiwan or plan to visit, get in touch with them, make a booking, and drop in for a bowl of fine tea! Great post! I’m very intrigued by this place and will see if I can visit while in Taiwan.